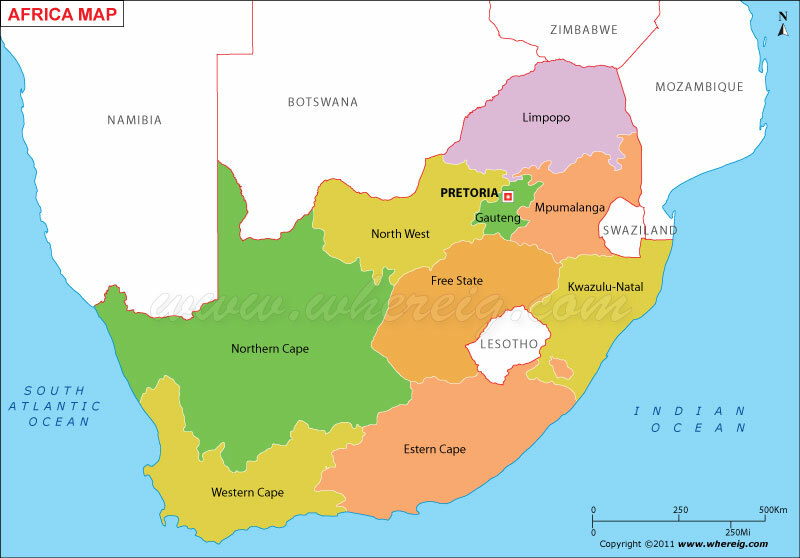 Description: The Political Map of South Africa showing South Africa States, cities, capital, international and state boundaries. South Africa, officially the Republic of South Africa, is a country located in the southernmost region of Africa. the country lies between latitudes 22° and 35°S, and longitudes 16° and 33°E. Neighbouring countries of South africa is Namibia, Botswana and Zimbabwe in north; and Mozambique and Swaziland in south. Capital of South Africa is Pretoria (executive), Bloemfontein (judicial) and Cape Town (legislative). South Africa official languages: Afrikaans, English, Ndebele, Northern Sotho, Sotho, Swazi, Tswana, Tsonga, Venda, Xhosa, and Zulu.